The American media has found itself in the intriguing position of not only reporting the news, but making news themselves. Unofficially known as the fourth branch of government, their role of adding another layer to the system of checks and balances, holding the powers that be accountable and protecting free speech is more crucial than ever. 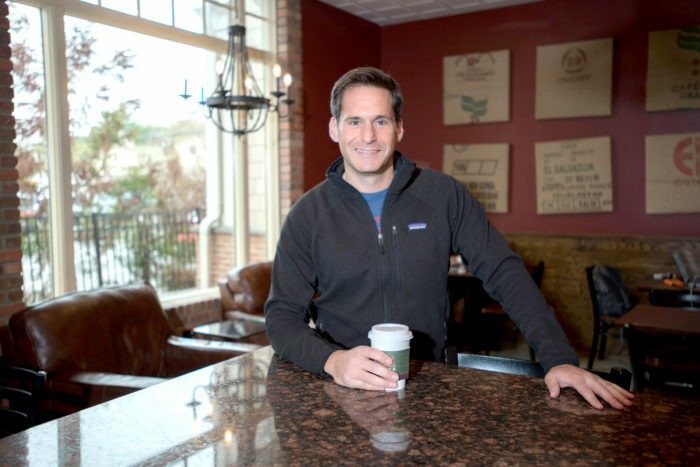 At the center of it all, Armonk’s own, CNN “New Day” co-anchor John Berman gives a compelling snapshot of what it’s like living in the spotlight of the news camera. Berman and his wife relocated from New York City to Armonk in the fall of 2011 as their identical twin boys, now fifth graders, prepared to enter kindergarten. He recalls the process, “We ended up in Armonk by chance. I’m from outside Boston and my wife’s from Vermont, so Westchester was in the right direction. Armonk was what we could afford, has great schools and is reminiscent of the small, woodsy towns we grew up in.” Berman has embraced the juxtaposition of city and country living as the assistant coach of his boys’ baseball team and an explorer of the local parks, even becoming an avid hawk watcher at the Audubon Greenwich. Berman spoke to aspiring journalism students at Byram Hills High School last year. One topic the Boston native refuses to remain impartial to, however, is sports, unabashedly saying, “It’s been easy to raise Boston fans in New York because we’ve been winning a lot.” Berman recounts a tale from 1995, when he was thrown out of Yankee Stadium for defending the rights of a Red Sox player who was “brutally attacked” by the Yankee pitcher. His assertion was met with shouting from the crowd and he was ultimately removed from the game. Donald Trump’s administration has become expert at diverting negative attention from itself, requiring journalists to be extra vigilant when covering the 45th president. 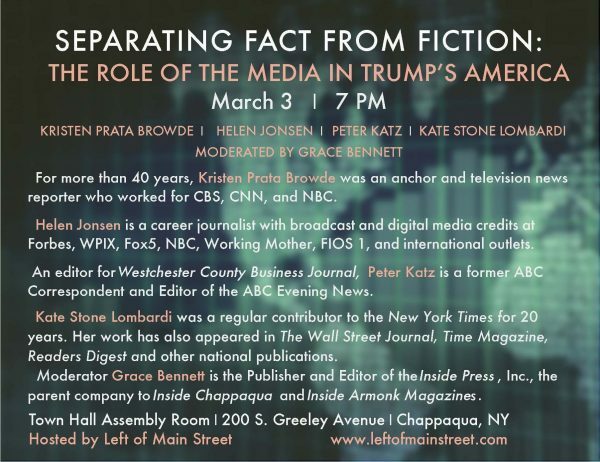 News professionals offered suggestions about “Separating Fact From Fiction: The Role of the Media in Trump’s America” during a panel discussion hosted by the activist Chappaqua group Left of Main Street (LOMS) Friday night. Moderated by Inside Press Inc. Publisher and Editor Grace Bennett, the lively and often chilling discussion among panelists—attorney Kristen Prata Browde, a veteran news reporter and anchor; Helen Jonsen, whose broadcast and digital credits include Forbes, WPIX, Fox5, NBC, Working Mother, FIOS1 and international outlets; Westchester County Business Journal editor Peter Katz and Kate Stone Lombardi, who has been a reporter for The New York Times, The Wall Street Journal, TIME, Readers Digest and other national publications—reinforced that media must double-down on its efforts to cover the 45th president. Left of Main Street (LOMS) founders and committee members joining the panelists at the conclusion of the Town Hall forum in Chappaqua. (R-L): Committee members Jennifer Sugar Frawley, Beth Hahn and LOMS founders Cynthia Metcalf and Ann Styles Brochstein. 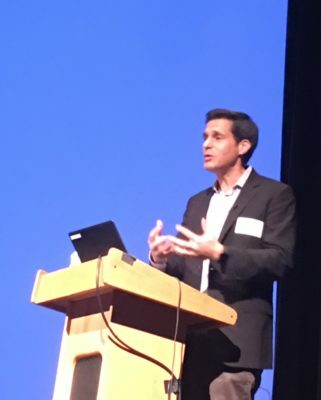 LOMS which originated as a Chappaqua-based group advocating for Hillary Clinton, is now “an activist group advocating for progressive ideas, candidates & legislation,” Brochstein explained to the audience gathered. “After the election we cried for a couple of days and then dusted ourselves off & decided to move forward,” she said. Since the election, media has been accused of “not doing its job” and of helping Donald Trump get elected, Bennett said in opening the discussion. Trump’s attempts to silence the press by calling it dishonest, dismissing reports as “fake news” and silencing reporters compound the Fourth Estate’s responsibilities. The panelists jumped right in. News delivery changed: social media is available via cell phones, Twitter, and it influences how much the public sees, she said. A comment that once stayed on the cutting room floor is what Trump uses to his benefit. If reporters don’t feel the companies they work for are backing them, then they’ll back off when facing difficult situations rather than risk losing their jobs, Browde said. Not only that, Jonsen added, people are surrounding themselves with others who agree with them and blocking social media news feeds of people who disagree with them. “We (reporters) were trained not to have political beliefs and to get a balanced story,” Lombardi recalled. While reporters have their own beliefs and opinions, she said, “That’s human bias and is very different from editorial slant. It’s important to distinguish between a newspaper’s slant and the quality of its journalism. The difficulty with filling 24 hours a day with news is that there’s no news filter, no editor, no time to fact-check, which allows Trump to speak all things, said Katz. Browde agreed the media pandered to Trump the celebrity and didn’t take him seriously. It also changes the public’s relationship to the president, who can Tweet something in 140 characters without anyone fact-checking. Katz agreed, adding this is the first White House to use social media as a main form of communication. “Meet the Press” host Chuck Todd challenged Trump advisor Kellyanne Conway for citing “alternative facts” and refusing to answer his questions, and American Urban Radio Networks reporter April Ryan stood her ground when Trump asked her to arrange a meeting with the Congressional Black Caucus. 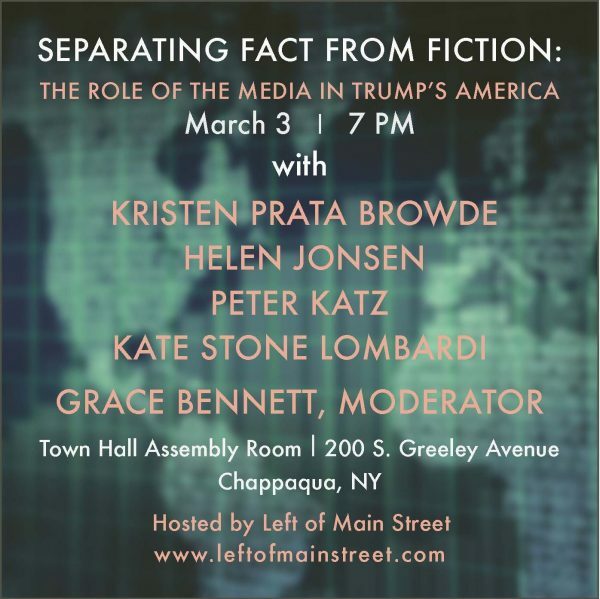 Chappaqua, New York–The Chappaqua-based group, Left of Main Street, will host a round table panel discussion “Separating Fact From Fiction in Trump’s America” on March 3, 2017 from 7-9 p.m. 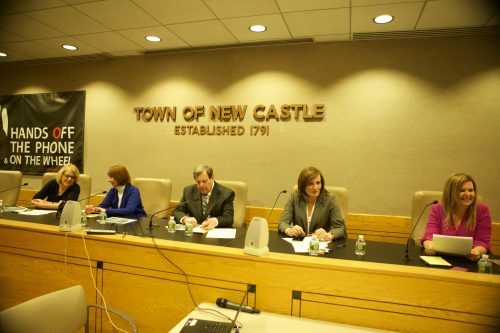 The discussion will be held in the Assembly Room at Chappaqua’s Town Hall located at: 200 S. Greeley Avenue, Chappaqua. Participating in the discussion are journalists from television and print media, including: Kristen Prata Browde former anchor at CBS News, Helen Jonsen former TV journalist at Fox 5 and WPIX 11, Peter Katz former producer, editor and Washington Bureau Chief at ABC News, and Kate Stone Lombardi a regular contributor to the NY Times. Chappaqua’s own, Grace Bennett, Publisher and Editor of The Inside Press, will moderate the discussion. 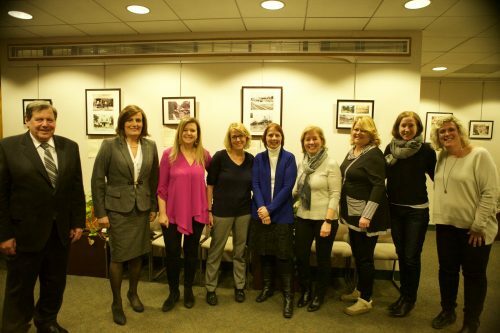 Founded by Chappaqua residents Ann Styles Brochstein and Cynthia Ware Metcalf, Left of Main Street advocates for progressive issues and candidates nationwide. You can follow their activities on Facebook, Twitter @LeftOfMainSt, Instagram, and at www.LeftOfMainStreet.com.